November has been a terrible month for Amazon. The election of Donald Trump, who has attacked Amazon and CEO Jeff Bezos on Twitter, and increased competition from Walmart, Best Buy and Target appear to be taking their toll on the stock. Shares of Amazon (AMZN) have fallen nearly 5% since Election Day, wiping out about $20 billion in market value for the company in the process. The net worth of Amazon CEO Jeff Bezos has taken a hit too. Bezos has been passed by both Berkshire Hathaway (BRKB) CEO Warren Buffett -- who is also not a friend of Trump -- and Spanish retail magnate Amancio Ortega -- who owns Zara -- in the process. Many big tech stocks -- including Apple (AAPL), Facebook (FB) and Google owner Alphabet (GOOGL) -- have fallen on fears about how Trump policies, especially a possible crackdown on immigration and potential trade wars with China, could impact the sector. But Amazon could be in the crosshairs of Trump even more than any other tech company. Trump and Bezos have already feuded on Twitter. The President-elect has taken issue with the coverage of his campaign by The Washington Post, which is owned personally by Bezos. Trump also has erroneously suggested that Bezos will use the newspaper as a tax shelter for Amazon and has claimed that Amazon is still losing lots of money -- even though the company is now consistently profitable. Bezos responded to Trump's complaints late last year with a tweet saying that he would like to send Trump into orbit on a rocket owned by his space exploration company Blue Origin. He also said last month that Trump is bad for democracy. But Bezos took the moral high ground last week, tweeting his congratulations to Trump after his victory over Hillary Clinton. So will this end the animosity between Bezos and Trump? Maybe. Maybe not. Amazon might have even bigger problems than The Donald in the Oval Office. While Amazon remains the undisputed leader of e-commerce, the latest earnings from Walmart (WMT), Best Buy (BBY) and Target (TGT) show that they are starting to nip at Amazon's heels. Walmart, which recently bought e-commerce unicorn Jet for more than $3 billion and struck a partnership in China with Alibaba (BABA) rival JD.com (JD), reported online sales growth of more than 20% in the third quarter. But Walmart's stock fell 4% since overall sales missed forecasts. Best Buy fared better though. It reported digital sales growth of nearly 25% from a year ago. Investors used to mockingly refer to Best Buy as Amazon's showroom because people would often go to Best Buy stores to check prices and then order products from Amazon instead. That's no longer the case. The company's overall sales and profits beat Wall Street's estimates too and Best Buy had a solid outlook -- despite the fact that the recall of Samsung Galaxy Note 7 phones and Samsung washing machines will cut fourth quarter sales by $200 million. Best Buy stock soared 7% on the solid results and the stock is now up 45% this year, thanks in large part to its digital success. And Target reported strong digital sales growth too. 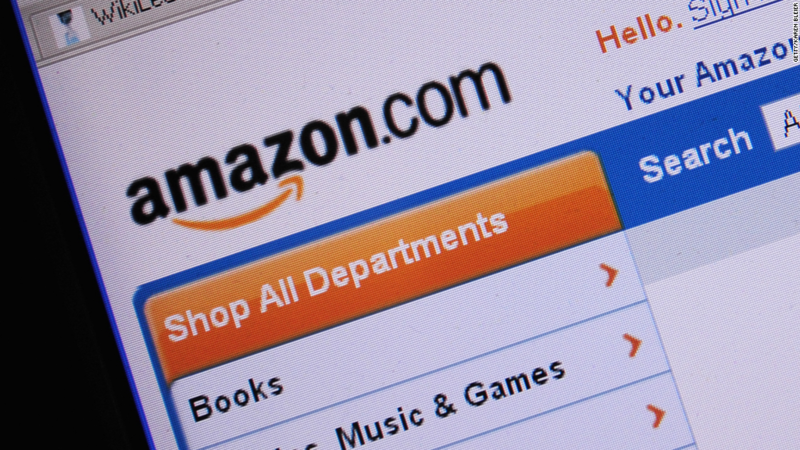 The company said Wednesday that e-commerce revenue was up 26% from a year ago. Of course, Amazon is now much more than a retailer. It's a leader in cloud hosting and a burgeoning player in the media business thanks to its original TV shows for Prime customers. But the combination of an unfriendly face in the White House and more competition from brick and mortar retailers may lead investors to finally question if Amazon's pricey stock -- trading at 85 times next year's earnings estimates -- is still worth it.